Ten years ago, on July 4th, while at a friend’s party I was introduced to a chocolate lover’s dream. It was so beautifully layered with fudgy brownies, silky chocolate pudding, and fluffy whipped cream. I didn’t know its name but please believe me when I tell you that it looked heavenly. However, soon after my eyes became fixated on the lovely dessert I learned that it was a Chocolate Brownie Trifle. Because I have a major sweet-tooth, I couldn’t wait to dig in and when I did it was so decadent, rich and simply out of this world delicious. 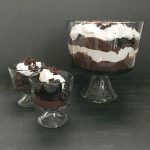 Since then, I’ve made Chocolate Brownie Trifle on numerous occasions, and it’s always a hit. In fact, over the years, I’ve made it a healthier dessert by substituting a few ingredients without compromising taste. As you read further, I will outline the substitutions below. Brownie: I always use my favorite box brownie mix which is Ghirardelli. I love all the different varieties of Ghirardelli brownie mix so just close your eyes and choose one. You can’t go wrong with either one. Now, for the important part, I follow the instructions on the box; however, I substitute the oil for unsweetened applesauce. Seriously, it is the best substitution to cut back on calories and fat without compromising taste. I promise you will not be disappointed. Chocolate Pudding: We absolutely love chocolate pudding, and my favorite brand is Jello pudding. Again, I follow the instructions on the box using either nonfat, 1% or 2% milk whichever one I have on hand. Tip – If you’re using boxed pudding, pour the milk in the mixing bowl first then gradually add the contents from the box while whisking. This technique will prevent lumps from forming in your pudding. Whipped Cream (topping): You can either make homemade or use your favorite store brand. When using a store brand, I go for the brand that does not contain high fructose corn syrup. We love to top our desserts with whipped cream whenever we can. Assembly: After the brownies have cooled completely, cut into small squares. Layer the bottom of your trifle dish with brownies, then pour half of the chocolate pudding, then whipped cream repeating the layering process ending with whipped cream. By the way, if you do not have a trifle dish, a tall salad mixing bowl will work just fine. With the 4th of July just a couple days away, this would be a perfect time to show off your skills and prepare this bowl of goodness with your family and friends. 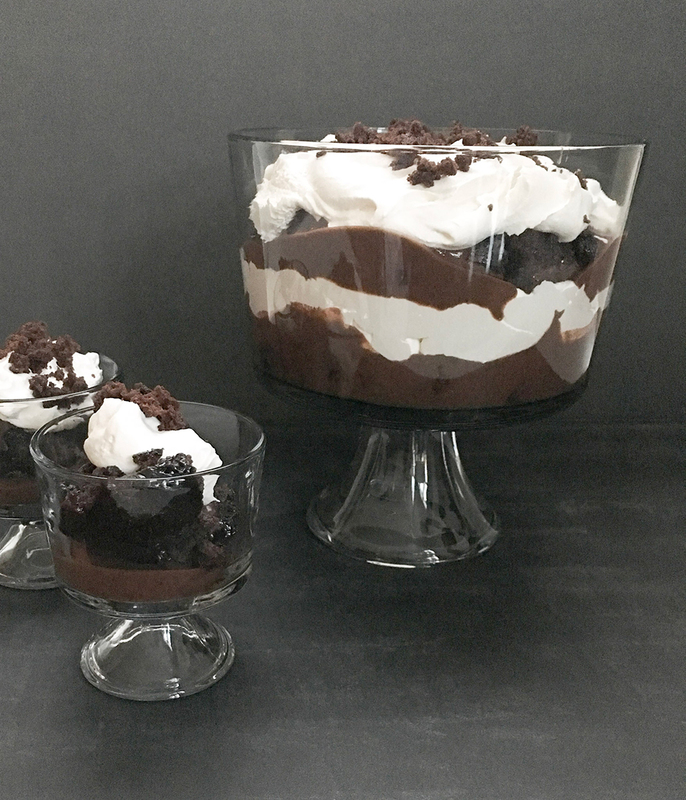 This Chocolate Brownie Trifle is a chocolate lover's dream. It's a healthier version made with applesauce instead of oil or butter. I can't even begin to tell you how luscious and decadent this dessert is. 2 boxes brownie mix Choose your favorite brand. You can feel free to make your brownies from scratch, but this recipe calls for boxed brownie mix. Prepare baking dish with parchment paper overlapping the sides of the baking dish with parchment paper. Spray prepared baking dish with cooking spray. Follow instructions on brownie box substituting oil for unsweetened applesauce. Pour batter into prepared baking dish and bake. For fudgy brownies remove brownie from oven a few minutes before recommended baking time is complete and allow baking dish to sit on counter for 3-5 minutes. 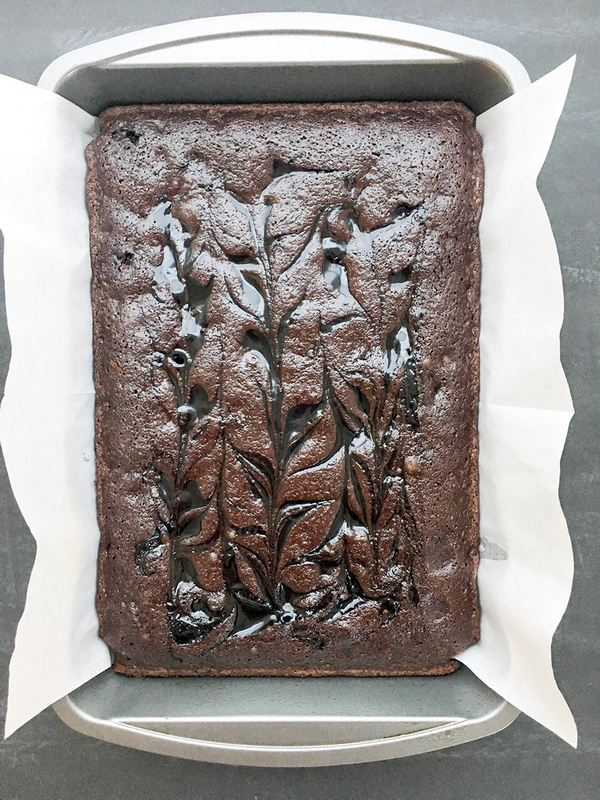 Lift brownie from baking dish by parchment paper and allow brownie to cool completely. When brownie has cooled completely, cut brownie into small squares. Slowly add contents from the box into the milk while whisking. Layer the bottom of the trifle dish or mixing bowl with brownies while overlapping the brownies, top the brownies with half the bowl of chocolate pudding, then add half the whipped cream, repeat the process ending with whipped cream. Chill in fridge for at least 1 hour. Substitute oil for unsweetened applesauce to cut back on calories and fat. If you're using boxed pudding, pour the milk in the mixing bowl first then gradually add the contents from the box while whisking. This technique will prevent lumps from forming in your pudding. Prepare baking dish with parchment paper overlapping the sides of the baking dish with parchment paper. Spray prepared baking dish with cooking spray. This technique allows the brownie to come out of the baking dish more easily. **Please note: Nutritional values serve as a guide only as values may vary.